Check to see if your name is in your state. Below are the states in which we had members. Click on your state and If you see a name or city that might be you, click on the name and send us an Email so we can get you back on the list with a years membrship for free. We didn't have many members on the Internet in the old days and most members didn't have an Emails. 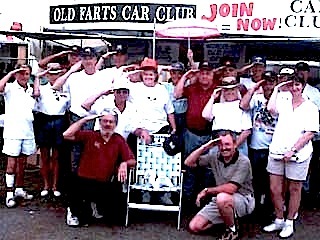 This was a salute to Dennis Hubbard , the original founder and guiding light of the Old Farts Car Club. Dennis passed away with cancer a few days before this picture was taken and he will missed by all who knew him and especially the gang at the Turkey Rod Run. Occassionally we will have pictures from any activities that we may have had in the states that we have visited. Here is one from the Tent at the Turkey rod run. The Yellow and white striped tent was one of the first tents and before we had designed our engineering marvel ''Bouncin Betty''. 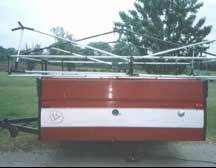 The little trailer expanded into a small shopping mall and was the source of much fun all over the miodwest, and the east coast.